Cumulative trauma injuries affect over 19 million workers per year and account for 85% of worker’s compensation costs. Cumulative trauma disorders are caused by the way we accomplish tasks, both on the job and at home. In the office environment, the increase in the use of computers has increased productivity and efficiency. But at the same time, their use can also be the cause of employee health hazards. 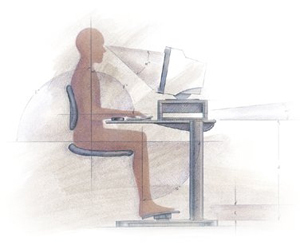 Office Ergonomics is a clear and easy-to-follow program that uses helpful examples to illustrate ergonomic risks and methods of control. It will help your employees identify the risk factors involved in their everyday work and offer them practical suggestions for healthier work habits.